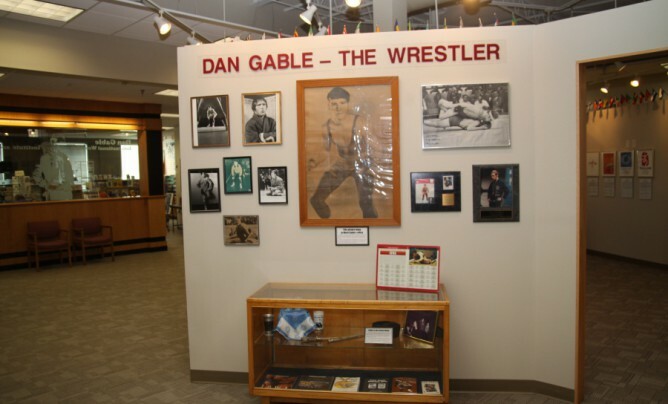 Three large walls and a huge display case chronicle the career of Dan Gable, the museum’s namesake. On display are the warm-ups and shoes he wore in the 1972 Olympics in Munich, where he won the gold medal at 149.5 pounds without surrendering a single point in six matches. Also on display is a large board that shows his entire coaching record at the University of Iowa, where he won 21 consecutive Big Ten team titles and 15 NCAA team championships.